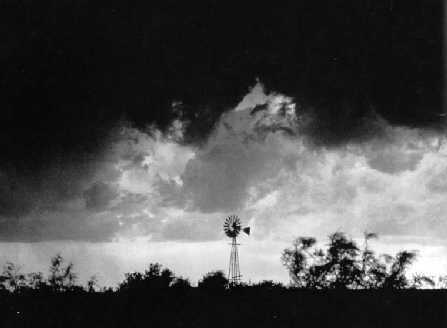 Windmills first made their appearance in Texas shortly before the 1870's. Prior to their appearance, the shortage of surface water in West Texas limited settlement to areas with a river, spring, or pond. Texas became the largest user of windmills in the United States until the introduction of electric motors and gasoline engines in the 1930s. Courtesy, Odessa Chamber of Commerce & Glenn Justice Illustrated book of Odessa. Photographer unknown.